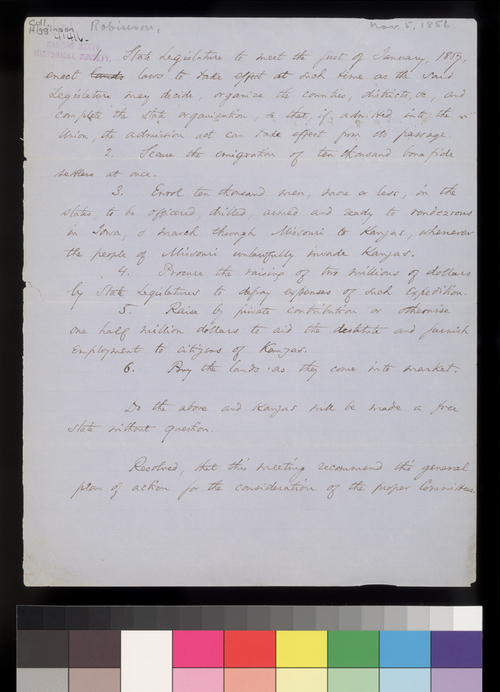 This document lays out the plan of action proposed by Charles Robinson at a meeting of free state leaders in Boston, Massachusetts, on November 5, 1856. Most likely these notes from the meeting were written by Reverend Thomas Wentworth Higginson, a radical abolitionist from Massachusetts. Six resolutions were passed, some focusing on emigration and others on land sales or fundraising. The back of the document lists the names of those present at the meeting, including such influential figures as Senator Henry Wilson and Eli Thayer.